Tyree Ruth (inset) is charged with robbing this North Center T-Mobile store at gunpoint on Friday. An eleven-time convicted felon helped rob a North Center T-Mobile store on Friday evening and was arrested when he bailed out of the getaway car near Boystown in the midst of a 6-mile police chase, according to a CPD spokesperson. Police said Tyree Ruth, 46, was positively identified as one of two men who robbed the store at 1958 West Irving Park at gunpoint shortly after 6 p.m. on Friday. Ruth was seen entering the store with a handgun displayed and he then demanded money and property from store employees, according to police. Acting on information gathered from two previous robberies, police searched the area for a white Chrysler 300 with front end damage and a Tennessee license plate. They found it as the car entered Lake Shore Drive with two occupants. A pursuit broke out on Lake Shore Drive, exiting at Belmont, and heading west on Barry. Ruth bailed out of the Chrysler in the 3100 block of North Broadway, but police caught up with him after a short foot chase. He is charged with one felony count of armed robbery with a firearm. State records show that Ruth was discharged from parole on March 11. He had been sentenced to two concurrent terms of five-years each for narcotics in 2013. Prior to his most recent prison stint, Ruth was sentenced to one year in prison for theft from a school or house of worship in 2011; six years for burglary in 2005; one year for retail theft in 2003; seven years for robbery in 2000; 15 years for armed robbery in 1991; a concurrent term of 15 years for armed robbery in 1991; yet another concurrent term of 15 years for armed robbery in 1991; a fourth concurrent term of 15 years for armed robbery in 1991; and a seven year concurrent term for burglary in 1991. He is due in bond court on Sunday afternoon. After Ruth bailed out of the car, his co-offender continued to lead police on a chase through Lakeview, Lincoln Park, and then into River North. Cops lost the car in heavy traffic near LaSalle and Kinzie. Police later found a handgun that they believe belongs to the Chrysler’s driver lying in the street at Wacker Drive and State Street, according to a department spokesperson. Investigators believe the Ruth and the other man may also be responsible for robbing an Uptown Boost Mobile store on Thursday afternoon and a Lakeview Metro PCS last Saturday. 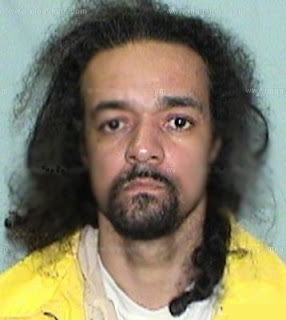 Investigators believe the suspect who remains at large is 50-year-old career criminal John Hummons, according to an internal CPD communication. Hummons is 6’1” tall and weighs about 190 pounds. He has two teardrop tattoos on his right cheek. Court records show that he was sentenced to 9-1/2 years in prison for Class X felony armed robbery in 2007; 15 years for Class X armed robbery in 1997; a second term of 15 years for Class X armed robbery in 1997; three years for being a felon in possession of a firearm in 1996; and three years for being a felon in possession of a firearm in 1994.